I felt honoured to be asked as a guest speaker this past weekend – Healthy Beginnings Chiropractic held a 4 hour “Make-Over” in St.Catharines. Dr. Marco Bouchard discussed the 3 essentials of health – Healthy Mind, Nervous System, Toxicity, and I discussed the 4th – Nutrition. 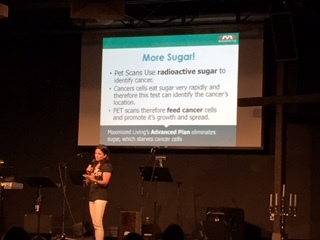 The entire presentation was on CANCER – how to prevent it, and optimize your health — It was a great turn out!! I brought my most inspiring patient along with me, to speak in front of everyone about his experience with cancer, and how Naturopathic Medicine saved his life, it was truly a life changing event!